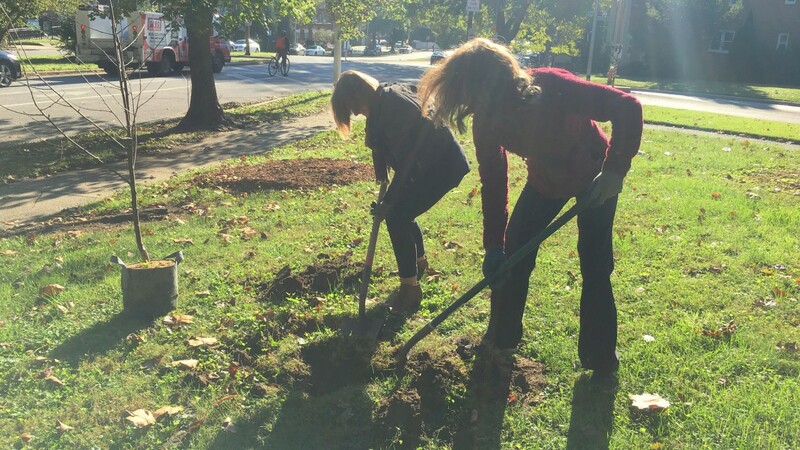 Equipped with pick-axes and shovels, nearly a dozen neighbors and acquaintances of Molly Macauley assembled near her former home in North Baltimore to plant two cherry trees as a way to honor their murdered friend. “I think Molly would have liked this,” said Marta Hanson, who organized the tribute with the help of the Baltimore Orchard Project. Neighbors had been fond of the flowers and tasty fruit of the two cherry trees that had been on that spot – in public space at the intersection of University Parkway and 40th Street where Macauley lived. In recent years, the trees had withered and been cut down by the city. On Thursday morning, Orchard Project planting coordinator Eric Sargent pulled up with their replacements: Two Montmorency cherry trees ready to be liberated from their pots. “We’re going to dig a hole that’s twice the width of the pot and the same depth as the pot,” Sargent said. The two AmeriCorps organizers he brought with him – Alex Walker and Chrissy Talbert – were standing by to distribute tools and gloves and to lend a hand. As the neighborhood volunteers dug through the black soil and hard red clay, they chatted with Walker and Talbert about their career plans – getting into a Masters degree program in social work, in Walker’s case. The Baltimore Orchard Project’s main mission is strengthening communities through planting and cultivating orchards. Since 2012, they have planted more than 1,000 fruit trees at more than 10 sites across the city. A part of Civic Works, “the Orchard Project also trains AmeriCorps members in job skills in the non-profit sector, as well as urban agriculture,” Sargent explained. You could learn about the group from its website. But another way to learn more about them – and get a free fruit tree – would be to attend the October 28 Fruit Tree Fair sponsored by the Baltimore Department of Recreation and Parks at Druid Hill Park, from 10 a.m. to 2 p.m. The event will take place at Howard Peters Rawlings Conservatory and Botanic Gardens on Beechwood Drive. 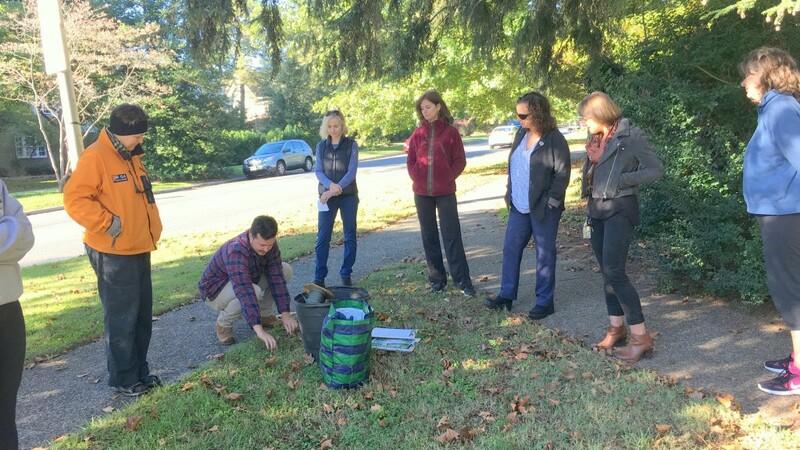 Sargent also said that most of the schools, churches and community associations who ask the group to bring in their free trees and expertise are looking to the orchards to provide food, gathering places and enhanced wildlife habitat. But some, he explained, like the group on Thursday, have wanted the orchard to memorialize someone in the community who was killed. The 59-year-old Macauley died after she was stabbed on July 8 while walking her dogs on University Parkway. She was the vice president for research and a senior fellow at the Washington-based Resources for the Future. Her field was the economic and environmental implications of space exploration. More than a year after her death, Baltimore Police have made no arrests.